The goddess of design, Lynne Goldsworthy , has wowed us again with her new quilt design – Vinyl – made with the new Makower Music Collection, due for release soon. I was very privileged to be asked by Lynne to re-create the pattern in EQ7. Isn’t it amazing! It looks great in the orange colour way as well. Look out for this pattern and fabric to be released by Makower by the end of the year. Also, this week I managed to fit in a teapot block from Sarah’s new book, ‘Hand Quilted with love’. The pattern is ‘All that and the hatter’. Fabric from the Kaffe Field Bouquet panel with a background of Pure Elements, Art Gallery Fabrics﻿ and a splash of Oh Cherry Oh by Me and My Sister Designs for Moda. Wow! 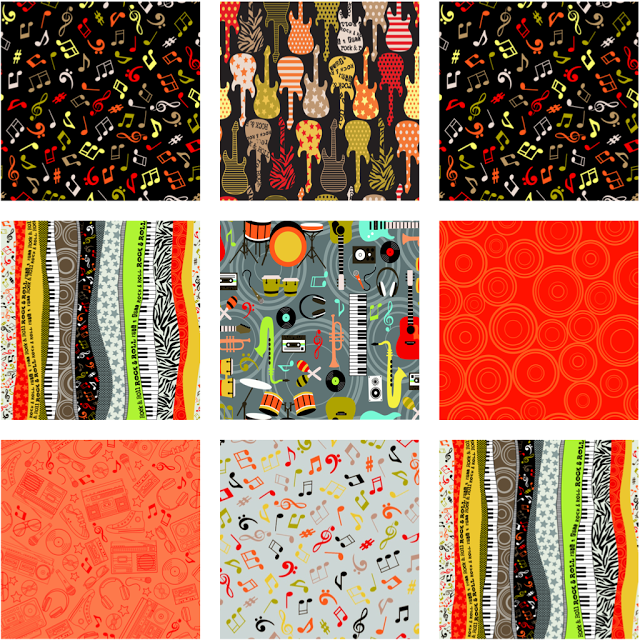 I love the Music Collection fabrics! Especially the one in the center on gray! That music fabric is so fun! I like the bright colourway. I love your teapot!! You are going to make a gorgeous version of that quilt! This pattern would be great to make a quilt for a friend who loves vinyl. Hope it comes out soon. I love that teapot, and the Music Collection fabric is amazing! The teapot is so colorful! The quilt is wonderful. the Vinyl pattern looks great. I also fancy that teapot block. The fabric is wonderful and bright.